As we are using pvbrowser upon other applications in one of our showroom demonstrators I wanted to give a first feedback to you on how we are using pvbrowser and thank you especially for the fast reaction according the opcxmlda daemon fixing. The LIST showroom will be used to demonstrate technology developed in the research centre and used in real world applications in collaboration with our partners. We have developed a real-time water distribution network control application that is based on a model predictive control approach to optimize the water distribution according several antagonistic operator objectives considering physical and operational constraints. We call this GPC for Global Predictive Controller. The controller application is developed entirely in python and uses OpenOPC (OPC-DA only) to communicate with the different local controllers (PLCs) that are located in the storage basins. 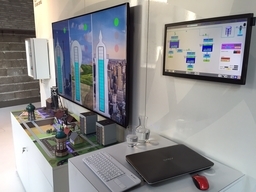 The SCADA system (in image 1 on the small screen) is realized by a partner using WinCC providing also the OPC-DA server and is ensuring the communication with the local SPS systems (in image 1 in the small rack-box hanging on the wall). 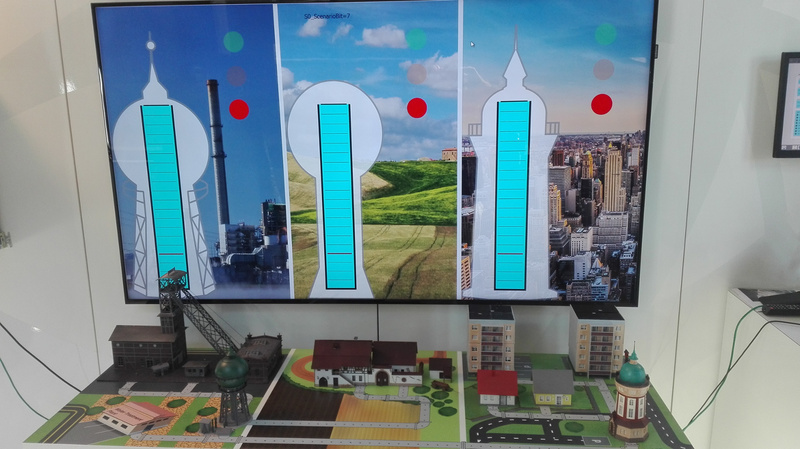 We use pvbrowser on the big LCD screen to graphically represent the 3 basin (tower) system the current filling (using svg animated objects) and the autonomy state of each basin (in an svg ample). The background images are changing according to the current simulated scenarios in order to visually tell the user that we are in a low consumption situation (wintertime) or in a high consumption situation (summer period) or in an emergency (fire) situation. The system is working using the opcxmlda deamon together with the Kassl dOPC XGate to bridge between OPC-DA and OPCXMLDA. It is especially targeting general public and not necessary expert domain persons that is the reason why we were searching for a tool that could provide us with system interactive reactions but also flexible enough to integrate other more graphical designer aspects. Thank you for having provided us with the open-source pvbrowser application that is doing a great job. Feel free to contact me at georges.schutz@... if you need additional information.